Polypropylene (Short : PP, PPH, PPC, PPCopo, PPs, PPel, PPast and many more) is a technical plastic that can be processed easy. It has a density of about 0,91g/cm³ which is the lowest of all technical plastics. The moisture absorption of standard PP is 0,0%. The E-value is at 1.400 N/mm² which is relativly low. The material is really good against lyes and acids and is easy to mill ( cut, milling, lathe, water jet cutting and welding ). It is the material of choice in tank construction for ventilation components and many more. 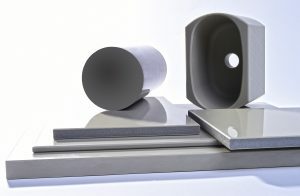 We offer pressed sheets from PP with thicknesses up to 280mm, cavity free and low tension. Also cuts and molded parts / technical plastic products ( milled and lathed parts ) from Polyethylene sheets or rods. Pressed sheets have in contrary to extruded sheets less tension, are better to machine but are a bit more expensive because manufacturing process. Standard colors of Polypropylene semis are nature and grey but special colors are possible if you get over an certain amount of 1000-2000kg. Polypropylene sheets offer a large variety for usage. Beside standard Polypropylene types like Homopolymer and Copolymer are some special types like Polypropylene low flammability, Polypropylene electrically conductive, Polypropylene anti static, Polypropylene UV resistant, Polypropylene fiber glass reinforced and many more.